Plaza are case bound menu covers with turned and finished edges. The outside cover, inside panel and corners tabs are made of a strong, durable imitation leather book cloth material which is easy to clean and accepts decoration beautifully. Diagonal corners on the panels hold your printed inserts in place. 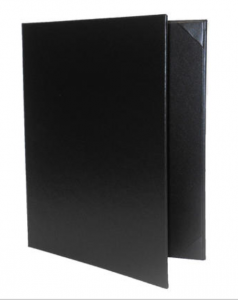 Plaza menu covers are in stock and ready to ship, available in black black only and popular sizes.